The boss of a firm which supplied a dangerous amphibious vehicle for use in the Lake District has escaped jail. A judge at Carlisle Crown Court had earlier condemned Tim Dutton-Woolley's vehicle as a "floating coffin." 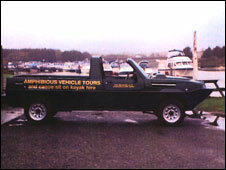 Windermere tour operator Adrian Cowdroy paid £34,000 to Sussex-based Amphibious Cars Ltd in 2005, for a vehicle to take families on tours of the lake. On Thursday Dutton-Wooley was given a six-month jail term suspended for two years for making false claims. During an eight-day trial in April, brought by Cumbria Trading Standards, a jury travelled to Windermere to watch the vehicle on the lake. They were told it was ordered in 2004 and delivered in December the following year. But lake wardens refused to issue a licence to allow the vessel to take passengers on Windermere. Dutton-Woolley, 60, from Worthing, was found guilty of supplying a vehicle that was not fit for the purpose of carrying fare-paying passengers on land and on water, contrary to the Trade Descriptions Act 1968. Passing sentence on Thursday, Judge Paul Batty said: "The vehicle was an absolute disgrace and undoubtedly unfit for the lake. It could have created an absolute tragedy." Phil Ashcroft, head of Cumbria Trading Standards, said: "The dangers of fare-paying passengers taking a ride on the lake in an unsuitable vehicle are obvious. I hope that by taking this action we've averted a future tragedy." Mr Cowdroy added: "This caused myself and my family extreme financial hardship over the last three years and deprived us of our savings and livelihood whilst leaving us with huge debts." Dutton-Wooley was also ordered to pay £28,500 compensation.